Sirsi, previously known as "Kalayanapattanam" in the Sonda Dynasty, is a city in North Karnataka. The city is famous for a number of beautiful temples and waterfalls. The city's income mostly comes from agriculture, and the main crop grown is the Adike or Arecanut. Sirsi happens to be one of the largest trading centres of Arecanut. Sirsi celebrates Holi in its own unique style. Artists perform a folk dance called "Bedara Vesha", five days prior to the Holi festival. This is accompanied by "Dollu Kunitha", another dance form wherein, artists play a local type of drum called "dollu", and dance to the tune while playing and strapping onto the drum. Winter months of October to February are ideal to visit Sirsi, since the weather will be cool and breezy. We recommend the Route 1 since it is the fastest and the quickest route of the three. You could stop at the following places before reaching Sirsi. The Shivaganga Hills is located around 55 km from Bangalore. The altitude of its peak is of the height 2640 ft, making it a great place for trekking or rock climbing. Shivaganga is a name adopted from the fact that the hill is shaped in the form of a Shivalinga and a small nearby spring is known as Ganga. Gavi Gangadhareshwara Temple is mounted on the top of the hill, inside a cave (Gavi means cave). The whole set up of the shape of the hill, flow of spring water and a cave present on top of the hill, is similar to Lord Shiva's living representation, making it all the more sacred for devotees. With an altitude of 3940 ft, Devarayanadurga is a hill station located at Tumkur at about 87 km from Yediyur. The beautiful hilltop is easy to trek with defined steps made on the hills. Devarayanadurga houses Yoga Narasimha Swamy Temple, which is a beautiful temple built in Dravidian architectural style. The foothills, however, is home to Bhoganarasimha Swamy Temple. 75 km from Devarayanadurga, is the small village of Kaggaladu, famous for its bird sanctuary. The backstory to the formation of this bird sanctuary from the locals is that, back in 1993, Grey Herons nestled on a single Tamarind Tree. The locals were so interested in protecting the birds that they stopped harvesting the Tamarind trees hosted by these birds, the reason for their multiplication. Apart from Grey Herons, the sanctuary houses a second largest number of Painted Storks. The city of Chitradurga, located 83 km from Kaggaladu, is tied with many legends of the past. It was ruled by several dynasties such as Rashtrakuta, Chalukya and Hoysala. These dynasties altogether are responsible for the construction and expansion of the famous Chitradurga Fort. It is a popular tourist destination in Chitradurga, which lies in the valley formed by Vedavathi River. The fort is separated into upper and lower fort, wherein, the upper fort has 18 temples! Chitradurga Fort is famous for the legend of Onake Obavva, the wife of a soldier fighting the invasion of Hyder Ali. In the absence of her husband, Mudda Hanuma, Obavva guarded a passage in the fort through which Hyder Ali's soldiers tried to sneak in. She single-handedly killed them all quietly, with her long pestle, hence she got the name "Onake Obavva" (Onake means pestle). Chandravalli Hills, Jogimatti Hills, Kallina Kote are some of the other famous tourist hotspots in Chitradurga. Nestled on the foothills of the Western Ghats and at the heart of the state, Davangere is a city located 60 km from Chitradurga. The city is known as the "Manchester Of India" due to the many cotton mills present. Davangere is home to numerous beautiful temples such as Sri Durgambika Temple, Sri Anjaneya Swamy Temple and Harihareshwara Temple. Davangere Benne Dose, the most popular dish in the whole of Karnataka, originated from here. It is a fantastic buttery Dosa that cannot be missed! Guladiki Unde, is another dish famous from Davangere that you must try. Ranebennur of Haveri district is located 37 km from Davanagere. This city has quite a few tourist spots that cannot be missed. Mukteshwara Temple in Chaudayyadanapura village is a magnificent temple built in Jakkanachari style. Dedicated to Lord Shiva, the temple is settled on the banks of River Tungabhadra. Sculptures found in external part of the temples are made with beautiful and intricate details. It is an excellent example of the Chalukya architecture. Ranebennur Blackbuck Sanctuary- which protects blackbucks, located in this city, is another place of interest.. 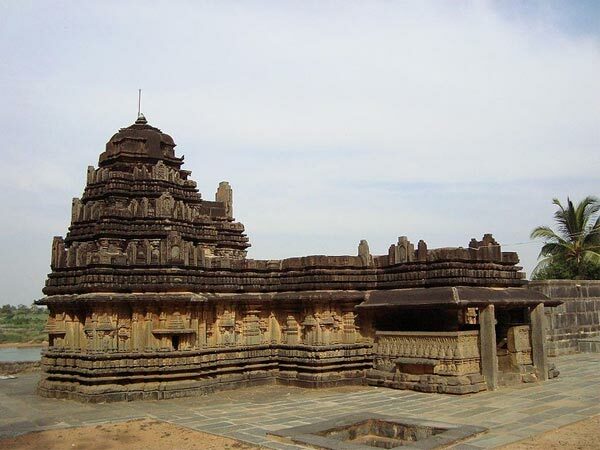 Situated 27 km off-route from Ranebennur is the temple town of Haveri. The district is swarmed with exceptional temples such as Siddheswara Temple, Nagareshvara Temple, Galageshwara Temple to name a few. All of these temples are classic exemplar relics of the Chalukya Dynasty's architecture. Siddheswara Temple was built with soapstone and faces west instead of the east facing structures created by the Chalukyas, which makes it unique. Built around the 12th century BC, it is a temple now dedicated to Lord Shiva. Find out next about the places to visit in Sirsi. Located around 80 km from Haveri, Marikamba Temple of Sirsi is dedicated to Marikamba, a form of Goddess Durga. Built in 1688, the article of focus in this temple is a 7 ft tall image of an eight-armed goddess Durga. The corridors of the temple are full of images of different deities from the Hindu epics. Marikamba Temple fair is held once every two years, in which procession of Goddess Marikamba takes place. The idol is taken on a chariot or Ratha to a place called "Marikamba Gadduge" and placed there for a week. It is a popular fair with people usually crowding the temple during this time. Unlike the other temples found on the way to Sirsi, Madhukeshwara Temple is believed to have been built during the Kadamba Dynasty, although changes have been made during the reign of other dynasties. The temple is located in Banavasi town, which is 23 km from Marikamba Temple. Dedicated to Lord Shiva, the architecture of this temple is relatively simple, and designs made on the pillars and ceilings are beautiful and nominal. Benne Hole literally translates to "Buttery Stream of Water", and that is the exact view of this waterfall! Formed by the tributary of River Aghanashini, Benne Hole Falls offers a breathtaking view, falling from an altitude of 200 ft. If you are an adventure-bug with some experience in trekking, this is a spot you'll love. The distance of trekking to the top is about 2 km, an exciting yet tricky task. However, the view from the top will leave you spellbound. Kailasa Gudda is a heavenly hill located 9 km from Sirsi. It makes for a great picnic spot since it is covered with lush green all around the hills. A view tower is situated on this hill, through which the view of greenery and beauty of the entire hill can be witnessed. An interesting spot to visit in Sirsi is the Sahasralinga, located inside the river Shalmala. The interesting bit about this place is the large number of shivalingas that are carved onto the stones of this river. There are many stones spread across the river, and these carvings are in full visibility when the water levels are low. During Shivarathri, the water levels reduce, and "sahasra" or thousands of carvings surface the river.